secret stairs 1, originally uploaded by Blair. why don't I think they are original? if you look behind them you will see a window arch (yes the basement has/d drop windows). 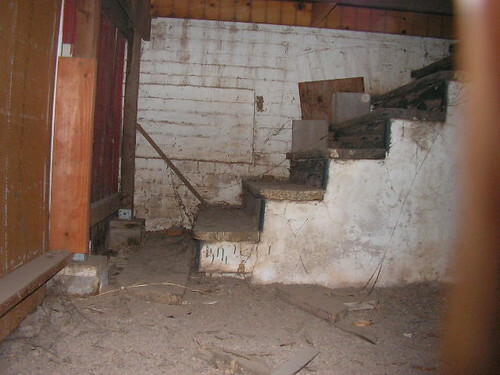 Someday I will go down and take pictures of the basement so you can see how big they were, they even opened it seems, but a pool, and the air-conditioner unit and the water heater all have seemed to force them to be closed up over the years. OH, Kaptain Kaos seems to have been able to salvage a window that looked pretty bad too! Kudos to Kaos.